Flybe has warned that weak UK sales are causing it problems. Sales in the three months to December 2011 were down 8% on a year earlier. Flybe said conditions in the UK domestic air travel market had continued to deteriorate and this trend would continue. There has been a general decline in demand for air travel during the economic downturn. Flybe said these conditions “will force” rationalisation of the European short-haul airline market. Shares in the airline have fallen more than 80% since the start of 2011. UK sales make up about 70% of Flybe’s revenue, but the airline is looking to expand into Europe. Shares in Flybe have slumped more than 20% after the airline warned that weak UK sales meant it was unlikely to meet revenue targets for this year. The company said sales in the final three months of 2011 were down about 8% on a year earlier, with December being “particularly disappointing”. This has led to a “significant shortfall” against revenue forecasts, the Exeter-based airline said. It does not expect to recover this shortfall before the tax year end. Flybe said conditions in the UK domestic air travel market had continued to deteriorate. It said maintaining passenger numbers and growing market share was more important than increasing margins, which it had hoped to do. “Based on latest sales trends, we believe that challenging market conditions will continue for the rest of the financial year,” the company said. These conditions “will force” rationalisation of the European short-haul airline market, something it was well positioned to benefit from, it added. “The UK domestic market is clearly challenging,” said Flybe boss Jim French. At one point on Tuesday, Flybe’s shares were down by about a third. Shares in the airline have fallen more than 80% since the start of 2011. In October, the airline issued its second profits warning in five months, noting a “significant slowdown in sales”. Analysts said the company was suffering from a general decline in demand for air travel during the economic downturn. “Demand is not what they thought it would be and customers are not willing to pay quite what they had hoped,” Douglas McNeill, airline analyst at Charles Stanley, told the BBC. However, he noted that there was “no immediate prospect of a serious recovery [in demand]”. Flybe shares slumped 30pc after Europe’s biggest regional airline warned that the dominant British market was deteriorating and the company will miss revenue targets this year. 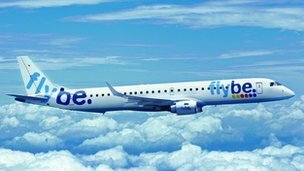 UK sales, which make up about 70pc of Flybe’s revenue, fell 8pc in the three months ended December 31, with sales last month “particularly disappointing”, the Exeter-based firm said in a trading update on Tuesday. Jim French, chairman and chief executive, has looked to combat the difficult trading environment by focusing on increasing market share, cutting costs “aggressively” and keeping revenue per seat contant. In a statement, Flybe said that that “challenging market conditions will continue for the rest of the financial year to March 31, 2012”. Despite the airline “disposing of surplus aircraft and reducing winter capacity”, its share of the UK market grew by two percentage points. Overall revenue grew 20pc in the third quarter, boosted by Flybe’s new Nordic joint venture. Last year the chief executive admitted he was “frustrated” after a third profits warning in less than year sent the shares down 36pc, but defended the decision to float the company in December 2010. Flybe shares were down 21.4pc at 54p in mid-morning trading.